From Dantica Cloud Forest Lodge the road continues downhill into the valley of San Gerardo de Dota for another 6 kilometers. 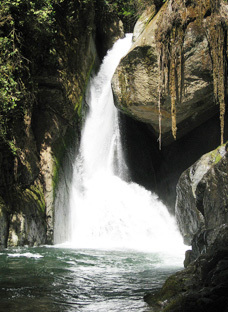 At the end starts a trail that brings you to the most beautiful waterfall of the valley, through lush lower montane forest. The hike is not too easy and will take at least 3 hours. There are some nice trails in this lower region with beautiful fern-trees. The church is open on Tuesday every first and third week of each month, at 14.00 PM. From San Gerardo towards San Jose there are some private forest reserves worth visiting, like Madre Selva or Finca Eddy Serrano. At km 50 you can turn left to the Los Santos region. Around the coffee towns of Santa María de Dota and San Marcos de Tarrazú there are a number of tours to be made, like the coffee tour, fruit tour and canopy tour among others. We work together with Los Santos Tours to arrange daytrips for you. Following the Pan-American Highway for nine kilometers towards San Isidro, you can visit the Paramó vegetation of the Cerro the la Muerte. From here you can see spectacular sunrises and on a clear morning it is possible to see both the Pacific Ocean and the Caribbean. You are here actually inside the reserve, because Dantica and San Gerardo de Dota belong to it. It consists of Lower and Upper Montane Cloud Forest between 1.500 and 3.000 meters altitude. This is Costa Rica´s newest National Park. 13 Kilometers towards San Isidro and 9 towards San José you wil lfind the entrances of this park with Upper Montane Cloud Forest and Paramó vegetation. The park ranger station is on the San José side. These beautiful gardens give you an good idea of the flora in Costa Rica in a nutshell. Lankester works on the protection and reproduction of many endangered endemic species, that is why we placed it in the protected area section. They are especially known for their orchid collection. On the other side of the Panamerican Highway you are already in the Tapantí National Park, though the entrance of the Park is in Orosí. The forest consists of Medium to Upper Montane cloud forest, but much more humid than the los Quetzales National Park. The highest volcano is definitely worth a visit. You can see both oceans from its highest view point. The vegetation consists of dwarf forest and bare land with two craters. 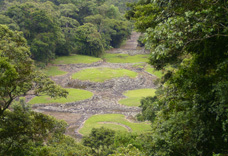 Here are Costa Rica´s largest and best known ruins, and especially its setting in lush forest makes it an interesting place to visit. This is a private reserve that is well worth visiting, especially because of its conservational emphasis, good bird and mammal watching and a large variety of tours and canopies. The perfect place to see dolphins and whales, though the latter are rather seasonal. The Park consists of several beaches and lots of open sea. While staying at our Lodge we are happy to provide you with more detailed information.